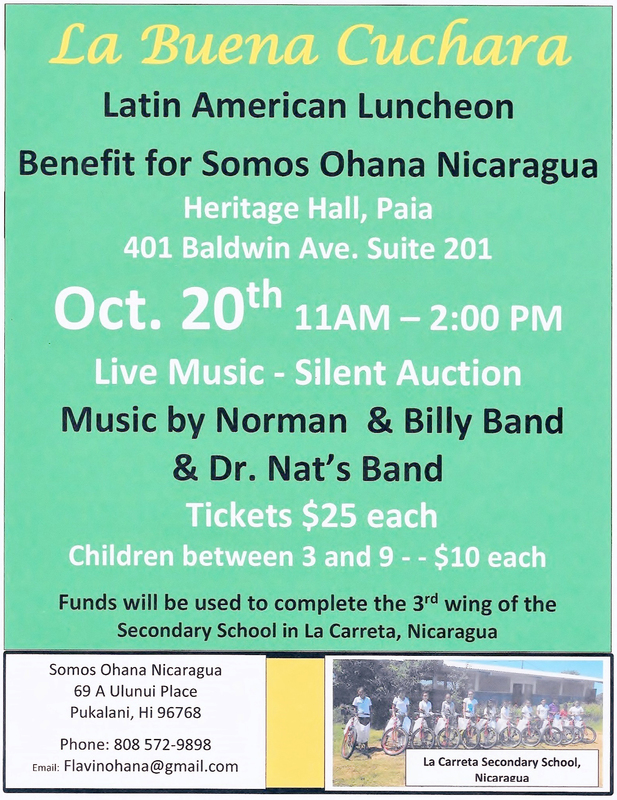 The Pukalani-based nonprofit Somos Ohana Nicaragua will host a fundraising luncheon on Saturday, October 20, at Heritage Hall, 401 Baldwin Ave. in Paia from 11:00 am to 2:00 pm. There will be typical Latin American foods, a silent auction and Nicaraguan craft sale, and live music. The N&B Band and Dr. Nat and friends will play Latin music for dancing while guests enjoy a lunch buffet and dessert table. The event will help the group fund the third wing of the rural secondary school they have built at La Carreta in northwest Nicaragua. The first two wings house a computer lab and classrooms for 133 students studying a traditional curriculum, with many community members coming for computer classes after school hours. The third wing will include a library, a combined kitchen-dining room and facilities for preparing and storing the agricultural produce from the school gardens, made possible by the recent completion of a potable water well on the school grounds. More information about the mission and work of Somos Ohana Nicaragua is at www.somosohananicaragua.org. Luncheon tickets are $25 ($15 is deductible as a donation) and $10 for children between the ages of 3 and 9, available at the door or call 205-4067. 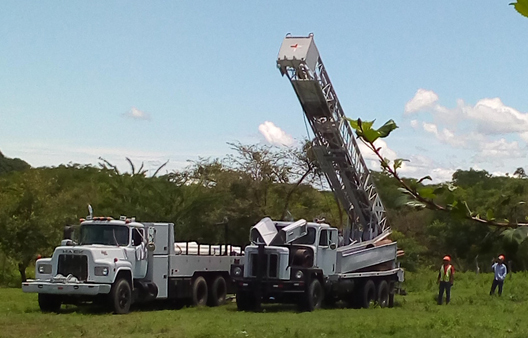 At the end of September of this year, 2018, the drill rig generously supplied by Amigos for Christ, with whom we partnered at Instituto Augusto Sandino in La Carreta, hit good water at 170 feet! It tested pure, so it will be the wonderful source of clean water for drinking, sanitation, growing and preparing the harvested vegetables in the school garden. This development will also soon allow for the addition of a small-animal husbandry curriculum at the school. 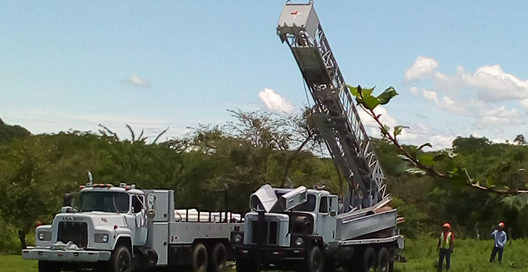 Currently the pipes are being laid to the motor house, all costs of which are covered by Somos Ohana Nicaragua. The achieving of a good water source for the school enables us to begin construction of the planned 3rd wing of this secondary school in La Carreta, providing the school with a kitchen/cafeteria, a library, and a teachers’ room.